Yesterday, Marvel dropped the bombshell that Jon Bernthal will play the Punisher in Netflix' Daredevil season 2. It's exciting, but does that mean that Jon Bernthalwill play the Punisher in an upcoming movie? Not necessarily. We'll examine the history of the character, his appearances in film and television. Finally, we'll delve into the question of whether his television appearance guarantees we'll see him in the movies. The character of Frank Castle, known as "the Punisher", was created by writer Gerry Conway and artists John Romita, Sr., and Ross Andru. Stan Lee came up with the name. Punisher first appeared in The Amazing Spider-Man#129 (1974). He started out as a villain, but quickly turned into a hero. In the comics, Castle's a war veteran and has an extensive knowledge of martial arts, stealth tactics, guerrilla warfare and demolition. After the death of his wife and children by a mob shooting in New York City's Central Park, Castle starts calling himself Punisher and wages a one-man war on crime. Castle is not your typical hero and regularly uses murder, kidnapping, extortion and torture. He also uses guns. A lot of guns. Jon Bernthal is well known for his roles on Wolf of Wall Street, The Walking Dead, and Fury before joining the next season of Marvel's Daredevil streaming on Netflix. Marvel describes Punisher as "one of Marvel's most popular characters. He is a vigilante who aims to clean up New York City's Hell's Kitchen by any means necessary, no matter how lethal the results. Jeph Loeb, Marvel's Head of Television said, "Jon Bernthal brings an unmatched intensity to every role he takes on, with a potent blend of power, motivation and vulnerability that will connect with audiences. Castle's appearance will bring dramatic changes to the world of Matt Murdock and nothing will be the same." There have been a few attempts to bring him into the world of live-action with mixed results. Marvel sold the film rights for Punsher to Artisan Entertainment back in the 1980s and produced a movie in 1989 starring Dolph Lundgren. It wasn't very successful. In fact, it tanked. In 2004, Artisan tried again with The Punisher starring Thomas Jane and then again four years later with Punisher: War Zone starring Ray Stevenson. The same year as War Zone, Lions Gate Entertainment merged with Artisan Entertainment and got the rights to The Punisher. But, in 2010, Marvel got the film rights back from Lions Gate. Kevin Feige said, "We're trying to figure out what to do with Daredevil now. Punisher could show up at one point. You know, once we get characters back into the Marvel fold we don't want to do something right away, we want to do the smart thing at the smart time." Either he was talking about Thor playing Whack-A-Mole with Punisher or having him appear in an upcoming movie. Has Punisher Shown up in the Marvel Cinematic Universe? In Captain America: The Winter Soldier the directing team of Joe and Anthony Russojoked that Frank Castle is in the movie. Twice in that movie, a yellow Penske truck slams into something or someone saving the day. In the comic books, Castle often driven a moving van. Was that the Punisher? Joe said, "The man who drives that truck, is very highly trained. He thinks on his own terms. He's got a plan and a very specific skill set." So, it was either Frank Castle or Liam Neeson. Either one works. A one-shot was talked about, but never materialized. This isn't the first time someone wanted to bring the vigilante to TV. In 2011, 20th Century Fox announced they were working on a Punisher TV show from former Criminal Mindsshowrunner Ed Bernero. It was planned as a "procedural cop drama." The synopsis was "Frank Castle, a rising star detective with the New York Police Department who moonlights as the vigilante Punisher, seeking justice for those the system has failed." Everyone said it was a terrible idea and filming of the pilot was cancelled in September 2012. Has Punisher Shown up in the Marvel Television Universe? There are a couple of connections between Daredevil and the other Marvel television show Marvel's Agents of S.H.I.E.L.D. In the early part of season two, Brian Patrick Wade played Crusher Creel as the Absorbing Man. He was hired Hydra to find the obelisk. In the Daredevilshow they showed a fight between Creel and Matt Murdock's father Jack. They never showed Creel, but the name implies they're the same. The other connection is that in the S.H.I.E.L.D. episode "The Writing on the Wall,” Agent Skye says she got information from an old friend named "Micro". In the comics, Punisher's tech expert is named David "Microchip" Lieberman. Are the TV and Movie Universe's Connected? So here's the big question: Are the movies and the TV shows connected? The slogan of Agents of S.H.I.E.L.D. is "It's all connected" but Jeph Loeb admits it's a philosophy more than a rule. he said, "Down the hall, there's this movie studio called Marvel Studios, which is separate from us but really gave us the inspiration for what it was." But not everyone agrees with that. Kevin Feige, president of production for Marvel Studios, told Screen Rant, "Well right now what Jeff Loeb and the TV guys are focusing on is those shows and certainly with ‘Daredevil' coming out last night and being so well received, the next one is already in production, the one after that has been announced, so I think they're doing quite well for themselves in that medium. We certainly have had discussions and thoughts of where down the line who could show up where but I think they're being very smart in saying, 'Let us establish this here, first' and they're off to a very very good start." Joss Whedon is more explicit that the two are NOT connected. "I think actually the movie people were a little bit cross about the TV show." he told IGN, "They were sort of like 'Well you can have this but not this. And this but not that.' It's complicated enough as it is without me adding another layer of complication. We also created a TV show called S.H.I.E.L.D.right before they made a movie where they destroyed S.H.I.E.L.D. So everybody's having a GREAT time." In fact, Whedon says that Coulson is dead in the movie universe. He told Buzzfeed, "As far as I'm concerned, in [Avengers: Age of Ultron], Coulson's dead. If you come back in the sequel and say Coulson's alive, it's like putting f***ing John Gielgud in the sequel to Arthur. It mattered that he's gone. It's a different world now. And you have to run with that." Charlie Cox, who plays Daredevil has a stipulation in his contract that he has to appear in Marvel movies if required, but isn't saying if it's ever going to happen. When asked if we'll ever see Black Widow (Scarlett Johansson) in Daredevil he told Empire, "I have to be careful because we just got commissioned so I have no idea who is going to turn up. Based on the show we've created, which is very grounded in reality, I'd like to see Punisher maybe show up, a little bit of Elektra maybe. I wouldn't mind Black Widow making an appearance, and you can't think about Daredevil for too long without thinking of Bullseye." So we know that Jon Bernthal is going to play The Punisher in Daredevil, we'll have to see if he ever shows up as The Punisher in the next Avengers movie. Daredevil will stream on Netflix in 2016. 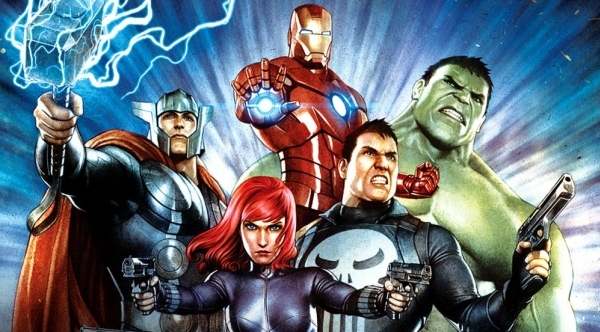 Do you think we'll ever see Punisher in future Marvel movies? Would you like to see him show up? I think adding him to Daredevil could be interesting. It could help Matt Murdoch define just how far he's willing to go to fight the bad guys. As for the movies, who knows? I don't think the Punisher would be much use fighting Thanos. If they put him in any movie it should be Civil War. In the comic version of that him and Captain America had a little tiff over tactics to use against Iron Man. It seems it might be a little late though they keep saying Spider-Man will be in it and they haven't even cast him yet. It will be fascinating to see how the two styles contrast. Daredevil is much more brutal than any other superhero in the Marvel movie or TV universe but he's not a killer. Castle shoots first and asks questions later and that's definitely going to create conflict and tension. Great lesson here. I didn't know about The Punisher.